I love the grocery store. Think what you might about me for this, but I really do! I love picking out what I am going to eat for the week – seeing what’s on sale and maybe should become a surprise guest on the menu. And most of all, I love trying new things. This past week when I was perusing the organic foods aisle (I still have so much to learn about organics) I saw something interesting. Yogurt alternatives. Now, I am not a vegan. But, I do like almond and soy milk! So why not yogurt? As a result, or Food Find for this Friday is…. 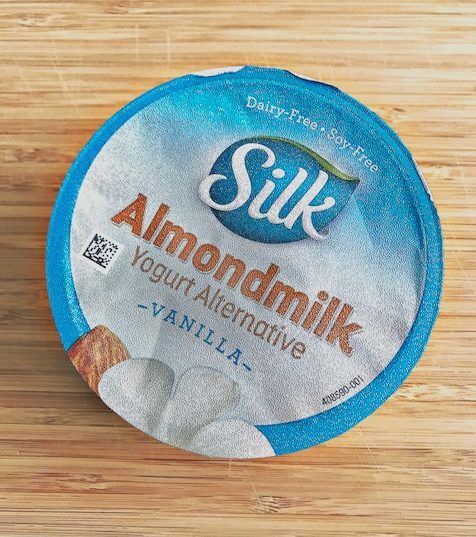 drum roll please… Silk Almondmilk Yogurt (alternative). There were quite a few different flavors but I really wanted to get the unadulterated taste of this “alternative” yogurt so I reached for the plain option. Then I reconsidered – I honestly don’t even like plain yogurt. That is UNLESS it is doused in honey – then it is my FAVORITE! So I upgraded to the vanilla flavored option. 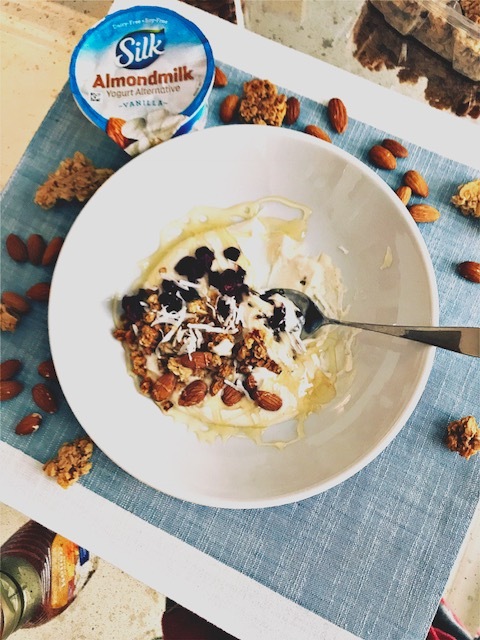 Not too flavorful or fruity to hide the true nature of the Silk Almondmilk yogurt. But also, not plain. When I got home I decided to do a double round taste test. 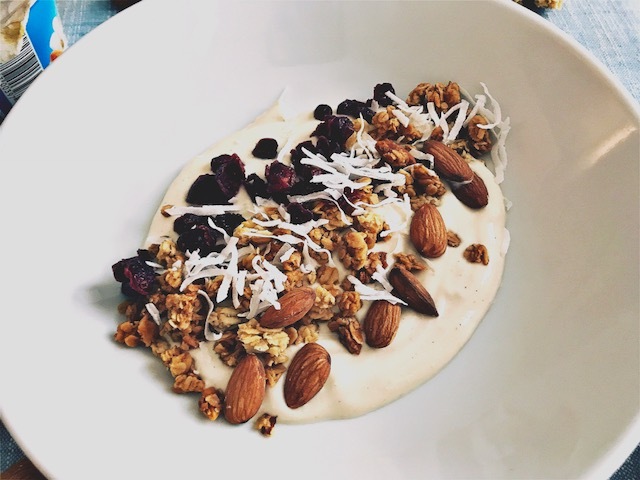 First I would try the yogurt alone, then I would try mixing with my usual favorites – granola, maybe fruit, nuts. 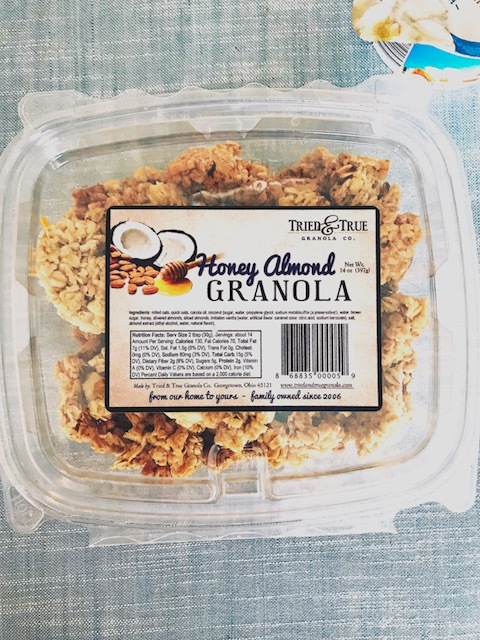 It also just so happens that while Jake and I were apple picking last weekend, we picked up some of this INCREDIBLE Honey Almond Granola from Tried & True – this granola is… WOW. I could write a whole separate Food Find Friday article about it! I decided to add on my traditionally favorite toppings – fresh granola, raw almonds, dried cranberries and unsweetened shredded coconut. I figured I would try it out this way, then perhaps add some honey for a little something extra! Alright – confession! I had actually never had dried cranberries in my yogurt before this… but I was out of fresh fruit!! It was dried cranberries or grapes… and yogurt covered grapes just did not sound great at the time. I figured yogurt covered raisins are a thing though! So how did the yogurt taste with all the toppings? Really good!! I am as surprised as you are! Now, maybe its because I was mostly tasting that amazing granola – or raw almonds – or coconut – but it was really good! 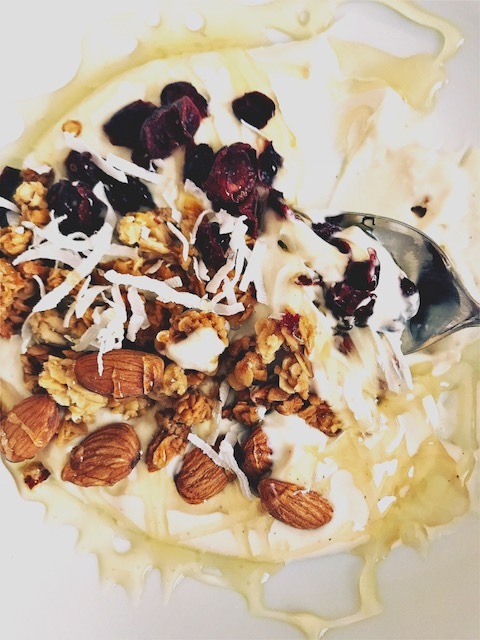 The creaminess of the yogurt perfectly complimented the unsweetened coconut/almonds and sweetened granola/dried cranberries. I figured – what the heck – might as well throw some honey on there too. GUYS OMG!! It was amazing!! I was so excited! Would these toppings and honey have tasted good on sawdust? Perhaps! But that should not take away from the fact that this concoction of Silk Almondmilk yogurt alternative, granola, almonds, honey, coconut, and dried cranberries was delicious! So what about the health aspects of this yogurt? 1 container contains 200 calories, 11 g fat, 21 g carbohydrates, 2 g dietary fiber, 17 g of sugar, and 5 g of protein. For comparison, a Yoplait Original French Vanilla yogurt contains 170 calories, 2 g fat, 33 g carbohydrates, 0 g dietary fiber, 26 g or sugar, and 5 g protein. So although the Silk yogurt is higher in fat and calories its lower in carbs and sugar. It is also higher in dietary fiber. Now let’s compare to a Greek yogurt – Chobani Vanilla blended non-fat Greek yogurt for example contains 110 calories, o g fat, 15 g carbohydrates, 0 g dietary fiber, 14 g sugar, and 13 g of protein. So the Greek yogurt contains less calories, fat, carbs, AND sugar – yet more protein! Some popular Greek yogurts on the market contain as much as 20 g of protein which is a great way to start your day! So maybe dousing the yogurt in honey and buttery granola is not the most dietetic or nutritional – BUT IT IS DELICIOUS! After enjoying my entire first container of Silk Almondmilk Vanilla Yogurt (alternative), I remembered something. 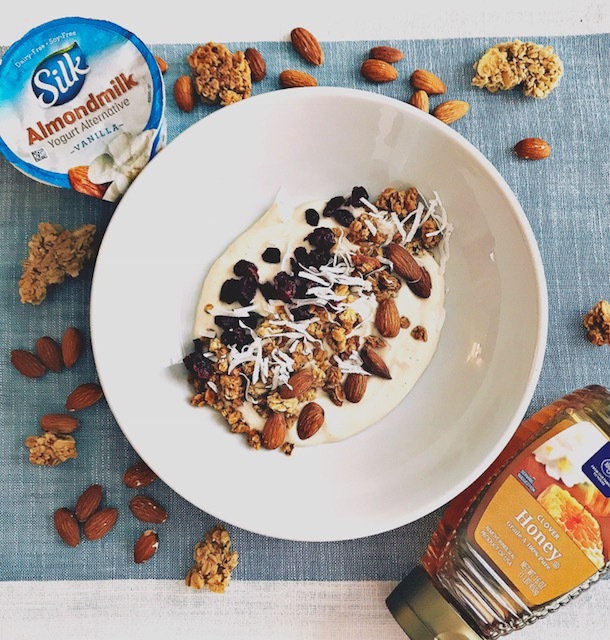 I did not like Almondmilk right away – so what made me think that I would like Almondmilk yogurt right away? It is an acquired taste! But even as I was eating my first few ounces – I liked it more and more with every bite! If you are looking for an alternative to yogurt for whatever reason, I hope you give this one a shot! And if you do, let me know what you think! 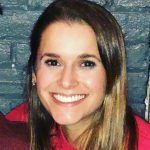 I’d love to hear your opinion! Loved this food find? Check out some of my other Friday Food Finds: Food Find Fridays: Spiced Pumpkin Pie Clif Bar and Food Find Fridays &#8211; Fig and Thyme Crisp Crackers.